It’s hard to believe that the frenzy of the holiday season is over. I’m still cruising on a sugar high. It’s time to come down soon, but first we have to finish off the dwindling supply of sweets. It’s been my tradition for a decade or more to make an assortment of treats to share with friends. The whole process is one of my favorite parts of the holidays. First, there’s choosing what to make. I usually mix old favorites with some new recipes. I also enjoy figuring out the right balance of cookies, candies, and nuts. Then, there’s the actual cooking, stirring up a whirlwind of sugar in the kitchen. Plus, there’s packaging everything up in a festive and inviting way, and, finally, delivering the packages to the people that made my year a special one. Then, we repeat the process, usually with a different assortment, for Howard’s colleagues for him to bring when he returns to the office after New Years. 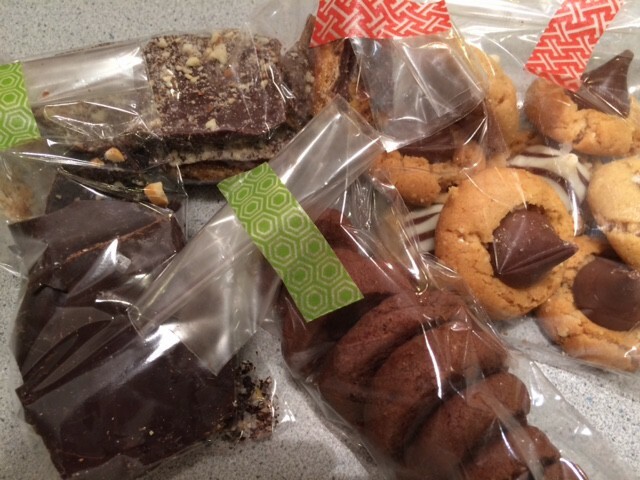 For my friends’ packages, I made two kinds of cookies, some sweet and salty nuts, and chocolate bark. For cookies, first up, I tried Speculoos from Dorie Greenspan’s newest book, Baking Chez Moi. These spice cookies are rolled into logs for slice-and-bake cookies, my favorite technique, though to be honest, I preferred the rolled out version I’ve made from her Around My French Table. I also chose another cookie recipe from an unlikely source, the out-of-print China Moon Cookbook. A long time ago, at my library’s book sale, I bought a signed copy of this book from a Chinese bistro that was once located in San Francisco, but I’ve never made a single recipe from it. It’s the dessert chapter that always tempts me with a variety of small cookies and luscious sounding tarts, all much more bistro-like than Chinese. The recipe for chocolate stars was calling to me, though my star cookie cutter wasn’t small enough, so I made snowflakes instead. These chocolate shortbread cookies were delightful. Cocoa powder made the dough chocolaty and the chopped dark chocolate gave an added burst of chocolate flavor. Even for this non-chocoholic, this recipe is a winner. I always like to include some kind of nuts for snacking. The Maple-Thyme Pecans in the new Ovenly cookbook, from the bakery in Brooklyn, were tempting. I made one batch with pecans and another with walnuts. With the second batch, I cut back on the amount of maple syrup to avoid the soupy puddle left in the pan with the first batch. The sweet from the maple was nicely countered by the herbal tones of the thyme and the saltiness of coarse sea salt. Finally, I took inspiration from David Tanis’ One Good Dish and made some Espresso Hazelnut Bark. This was as simple as topping melted bittersweet chocolate with chopped toasted hazelnuts, crushed coffee beans, and flaky Maldon sea salt. For packaging, I thought I had bought wintery gift bags at the end of last year’s holiday season, but I couldn’t find them. 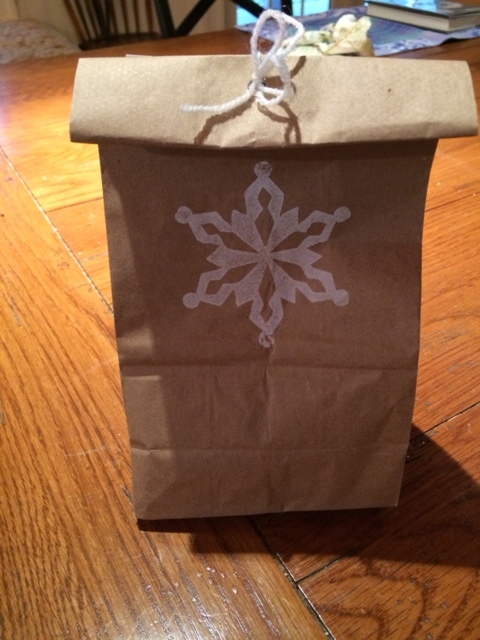 I used paper lunch bags which I rubber-stamped with snowflakes and tied them close with white yarn. For the individual items, I fill clear candy bags and typically seal them with our sealer. This year, I did something more interesting. Early in December, I was searching the internet to re-find a white felt wreath I’d seen, but couldn’t remember where. My search brought me to a new (to me) website, White Gunpowder. Though the felt wreath project I found on Kay and Bill’s blog wasn’t what I was looking for, I did discover lots of inspiring new packaging ideas. They were also having a giveaway for an assortment of their favorite packaging supplies. Miraculously, I won! 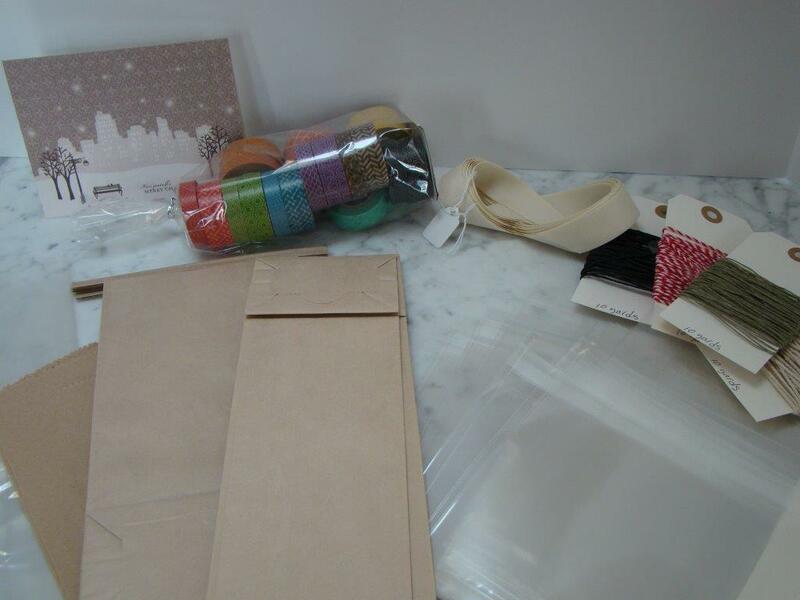 For this year’s holiday packages, I used the decorative tape to close up the bags. 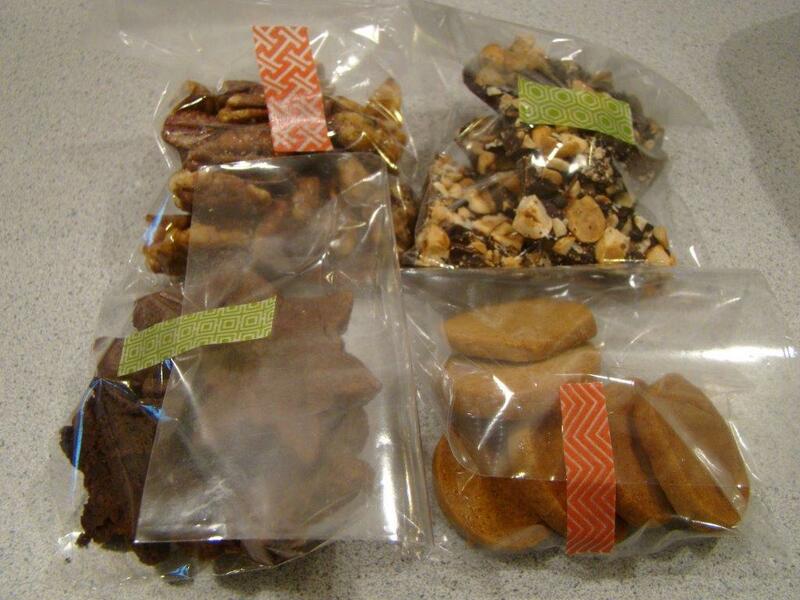 The colorful tape added festive color, plus made the bags easier to open and reseal. I’ll continue to enjoy playing around with the assorted bags, twine, ribbon, and tape that came in my package from White Gunpowder. You should check out their site when you get a chance. For the New Year’s reprise for Howard, he wanted to go with an all-chocolate theme (his favorite flavor). We repeated the espresso hazelnut bark complemented by Karen’s Cracker Candy topped with chopped almonds (which we’ve nicknamed Toffee Crunch) and World Peace Cookies. To round things out, Howard wanted to include Peanut Blossoms, the peanut butter cookies with a Hershey’s kiss pressed into the top. A nostalgic favorite, I hadn’t made them since I was in high school, though I have sampled them on holiday cookie platters, just not at my house. I used the cookie dough recipe I found on Liz’s site, but baked the cookies a little longer and did not return the pan to the oven after pressing in the kiss (the candy melted too much). I located the gift bags in time for this set, and we used the decorative tape again to seal the individual treat bags. Overall, this was the perfectly sweet way to end one year and bring in the new. I won’t tell you how many pounds of butter I went through! I will say that I see lots of soup simmering on the horizon to help push the diet back on track to more healthy eating. If you still feel like indulging, you can follow links above or here are a few of the recipes I made that are not already on-line. Preheat the oven to 400F. Toast the hazelnuts for 10-15 minutes, until skin is very dark. Rub the hazelnuts in a dishtowel to remove the skins. Coarsely chop the hazelnuts. Set aside to cool. Place the coffee beans in a ziplock bag. Use a rolling pin to crush the beans. Coarsely chop about 80% of the chocolate. Chop the remainder a bit finer. In the microwave, melt the coarsely chopped chocolate. (Start with 1 minute on full power, stir, then heat at 50% power in 30 second increments, stirring after each burst, until completely melted.) Immediately stir in finely chopped chocolate until it melts completely. This tempers the chocolate which gives it a nice sheen when it cools. Use an offset spatula to spread the melted chocolate to cover the baking sheet. Sprinkle with the chopped hazelnuts, then the coffee beans, then the flaked salt. Lightly press the toppings so they adhere to the chocolate. Chill until firm. Cut or break into pieces. In the bowl of an electric mixer, cream the butter and sugar on medium speed until smooth and light, 3 to 4 minutes. Add the vanilla, flour, cocoa, salt, baking soda, and chocolate bits, and mix until well blended, about 2 minutes. Gather the dough into a ball and flatten slightly. Dust a large piece of parchment paper with flour. Place the dough in the center. Place another piece of parchment on top. Roll out the dough to an even ¼-inch thickness. Refrigerate rolled-out dough until firm, about 1 hour. Preheat the oven to 350F. Line large baking sheets with parchment. Using a 2-inch cookie cutter, cut out cookies. Place ½ inch apart on the baking sheets. Reroll scraps and cut more shapes. Bake until the cookies are firm enough at the edges to slide easily off the parchment, 12 to 15 minutes. The cookies will be soft but will crisp up as they cool. Cool on the baking sheets set on wire racks. I used the 72% dark chocolate from Trader Joe’s. The recipe called for making stars, but my star-shaped cutters are 3-inch or larger. I have 2-inch snowflake cutters, so that’s what I used. I was going for size over shape. The 2-inch size is perfectly bite-sized. When I rerolled the scraps, I did not chill the dough again. This week I decided to make the Sweet and Spicy Cocktail Nuts. This recipe provided practically instant gratification, or, if not instant, within an hour. I had all the ingredients in the pantry, and it was so easy to put together. The recipe could be made with any mixture of whole or half nuts. I chose to make my version with all almonds. First of all, they’re my favorite. 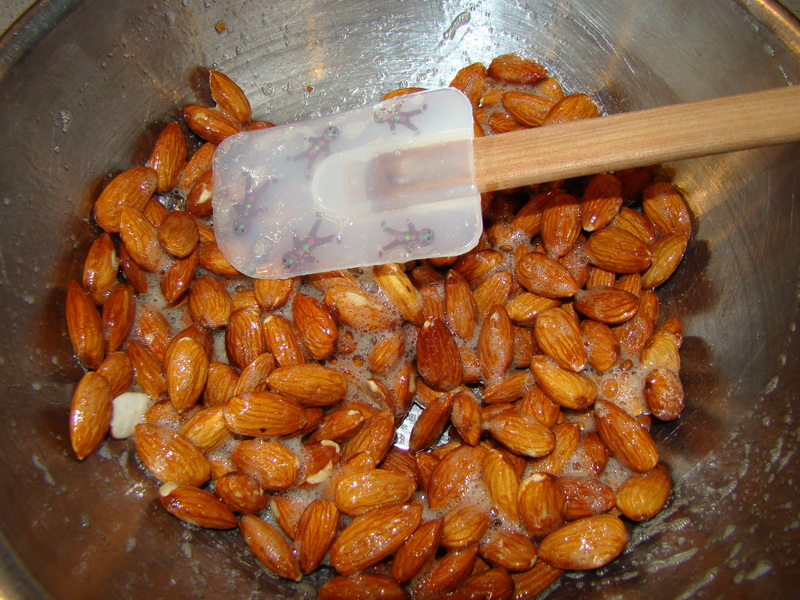 Secondly, I’ve been fixated on almonds since my book group meeting earlier in the week. I sat next to a bowl of almonds coated in sugar and cinnamon. I munched on them throughout the evening. 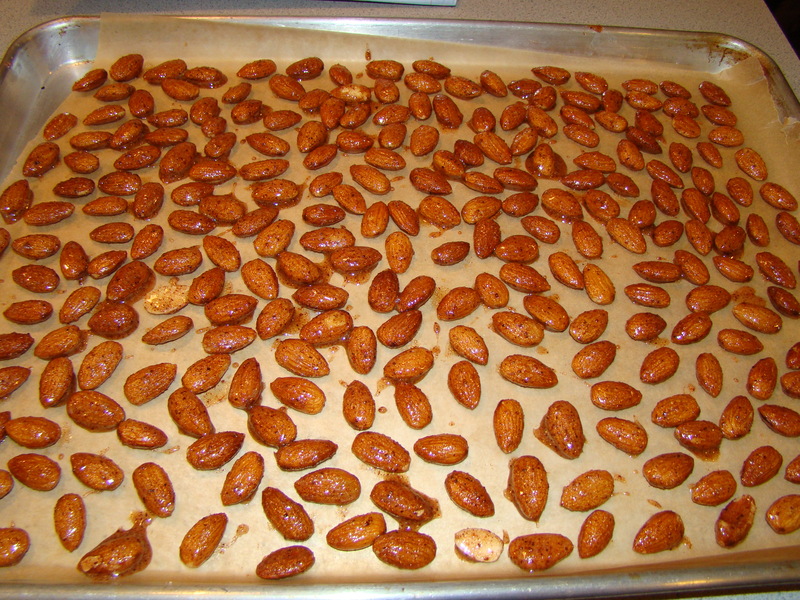 Now I can continue the binge with a batch of sweet and spicy almonds. As I mentioned, this recipe was super simple. The one step that I questioned was placing the nuts on the baking sheet one by one. I’ve made many batches of nuts like these and usually just spread the nut mixture on the baking sheet without much care other than making sure they are in a single layer. I thought I’d take that same shortcut with this recipe. Then I decided that I’d follow this recipe and see if it made a difference. After the stressful week I had, both work-wise and personally, putting those nuts down one by one turned out to be a meditative and calming exercise. The goo on the nuts still melted and connected them to each other, but they still broke apart easily after they baked. I think you could just spread the nuts into a single layer with a similar result. As for spices, I made the basic recipe in the book, no variation. For chili powder, I used medium hot chili powder from Penzeys Spices. Even with the pinch of cayenne, I think I could have used a hotter chili powder to give it more of a kick. Nevertheless, this recipe was still quite successful. 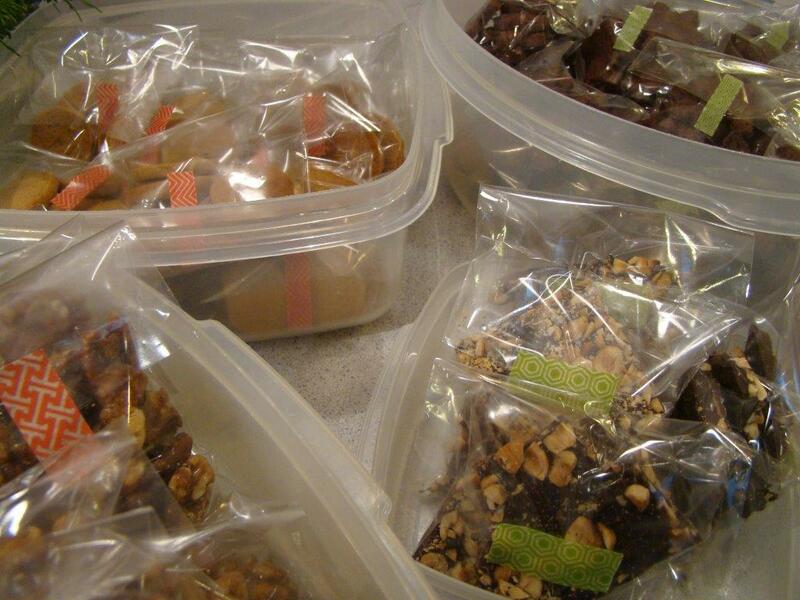 For the holidays, I usually put together little gift packs of assorted homemade treats. These would be a good addition. I might make another batch this weekend, with a slight alteration to the spices. As a side note, if you like this kind of nut mixture, I suggest checking out a favorite cookbook of mine, Party Nuts by Sally Sampson. This book contains many creative combinations of nuts and seasonings. 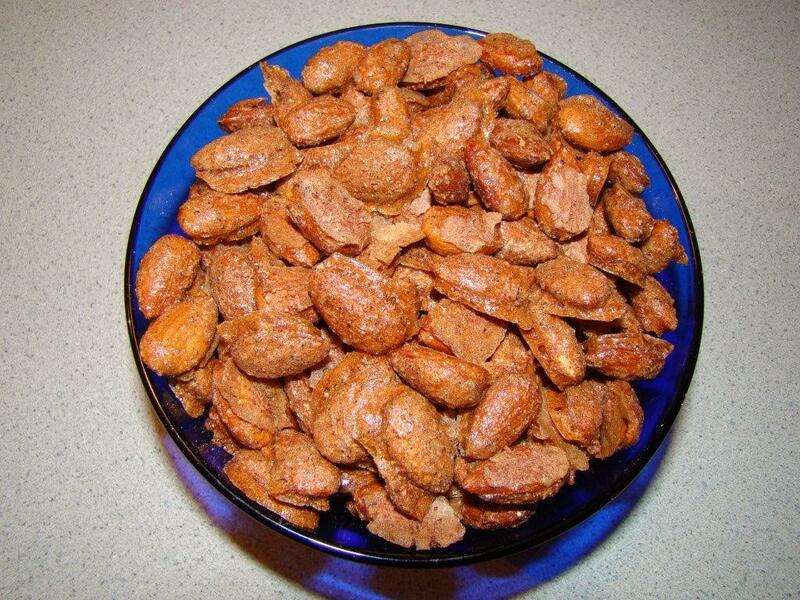 Every recipe I’ve made from Party Nuts has been a resounding success. If you want to read about my fellow cooks’ experiences cooking from Dorie Greenspan’s Around My French Table this week, check out their links on French Fridays with Dorie. Even better, you can buy your own copy of the book, and join in the fun.